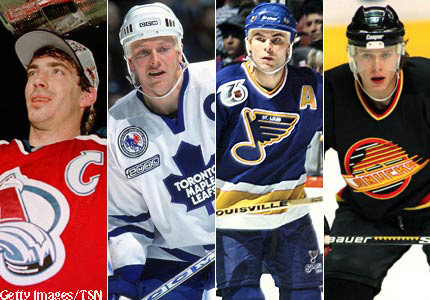 Dirty Dangle Hockey: Where Does This Hall Of Fame Class Stack Up? Where Does This Hall Of Fame Class Stack Up? Yesterday we ran a piece on what it takes to be a Hall of Famer using averages of stats and championships from modern era players who were inducted into the Hockey Hall of Fame. Using those numbers, we want to see how the 2012 Inductees - Joe Sakic, Adam Oates, Mats Sundin, and Pavel Bure - stack up with those players. Are they among the best? No arguments here on the four players merit for the Hall of Fame. Sakic was a shoe-in with his high point total and championships. Oates was always in some sort of debate for being 16th all-time in scoring and 6th all-time in apples. Sundin lacked the championships and awards, but he put up great numbers with not a lot of talent around him (we hope he congratulates Jonas Hoglund during his induction speech). Bure led the league in scoring three times in his 12-year NHL career, and ranks 5th all-time in goals/game with 0.623 - it's a shame we didn't get to see more of Bure as he retired at age 31. Sakic is the only player of the four that fits the modern era HHOF mould with 500+ goals, +1250 points, 2+ Stanley Cups, at least 1 gold medal, and 4+ individual awards. Adam Oates joins Ciccarelli and Federko has the only players without any Stanley Cups, gold medals, or individual awards. Mats Sundin has the 2nd most gold medals of the 39 players with 4. Bure's 3 goal scoring titles put him in the same company as Lemieux and Hull. Decent Hall of Fame class, but really Sakic is the only guy that ever won anything. You don't need to win Cups or any Major awards to make the Hall of Fame?